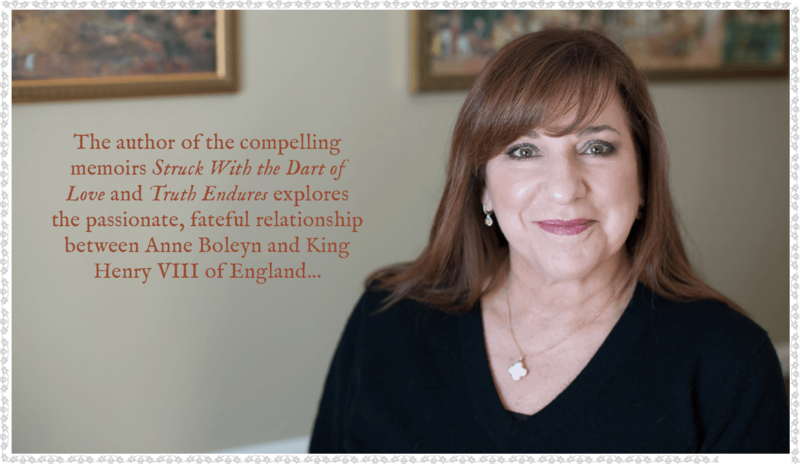 I am thoroughly delighted to have been the guest speaker on the wonderful podcast series The Talking Tudors, hosted by host Natalie Grueninger . 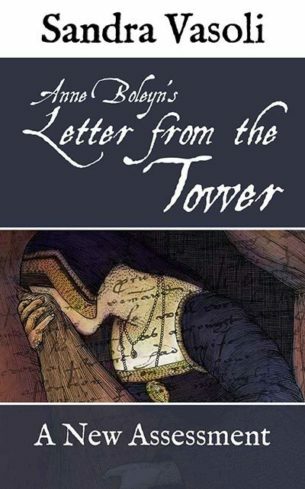 Natalie and I discuss my ongoing research of Anne’s Tower Letter – and I will have some interesting revelations to share! Please tune in and have a listen! 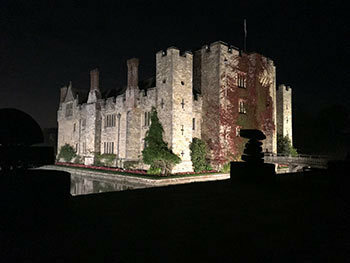 In October, I was thrilled to visit the stunning Hever Castle, childhood home of Anne Boleyn, in the lovely Kent countryside in England. 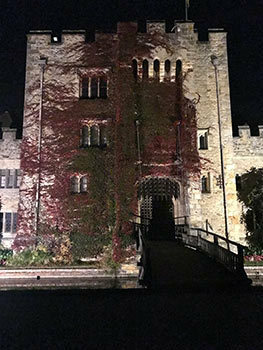 Not only was this the home of Anne’s youth, but it is where the relationship between Anne and the King, Henry VIII blossomed, as he visited her there on several occasions. Although some of the castle’s interiors have been changed and refurbished by William Waldorf Astor in the early 20th century, there is much which remains as it was during Anne’s time. 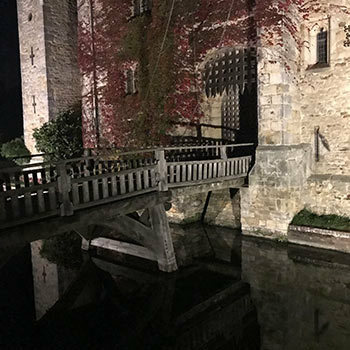 Here are some nighttime views of the castle – very evocative of the early 1500’s. As part of my continuing study of items which have belonged to Anne, and were touched by her, I was very privileged to inspect the gorgeous, tiny psalter which I believe was Anne’s. It’s in the British Library, and it was incredible to study it closely. 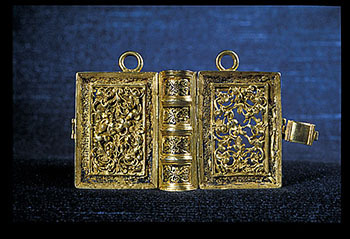 Read the article I wrote about that experience, published in the wonderful Anne Boleyn Files. I am delighted to welcome you to my website! Among many interests, I have a deep and abiding love for all things historical: events, fashion, mannerisms, houses – and also words and language. One of my favorite periods is that of the English Tudor dynasty. What could be more intricate and impassioned than the dynamics in the Court of Henry VIII? 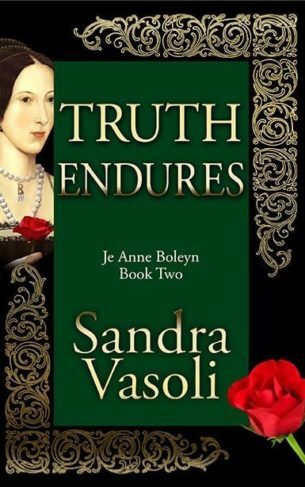 With a keen fascination for the breathtaking life of Henry’s second queen, Anne Boleyn, I wrote Anne’s fictional memoir. 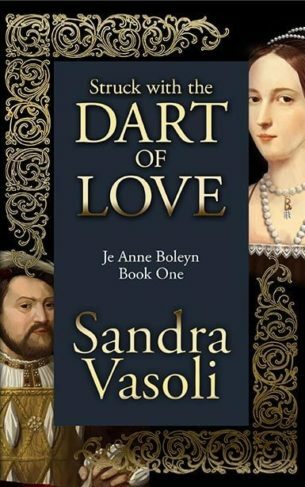 The two volumes of the Je Anne Boleyn Series: Struck With the Dart of Love, and Truth Endures tell the story of a love for the ages – that of Anne and Henry, a pair matched in brilliance but ultimately tortured by their liaison.